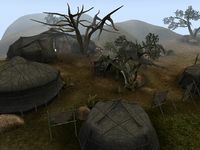 The Ahemmusa Camp is an Ashlander settlement that had been set up in Vvardenfell by the Ahemmusa tribe at various points throughout history. In 2E 583, it was located southwest of Balmora in the Bitter Coast, and in 3E 427 it was located directly north of Vos on the north coast of the Grazelands. It is a point of relative stability for the Ahemmusa Ashlanders. The camp is the location of the Healer, Wise Woman, and other tribal dignitaries. 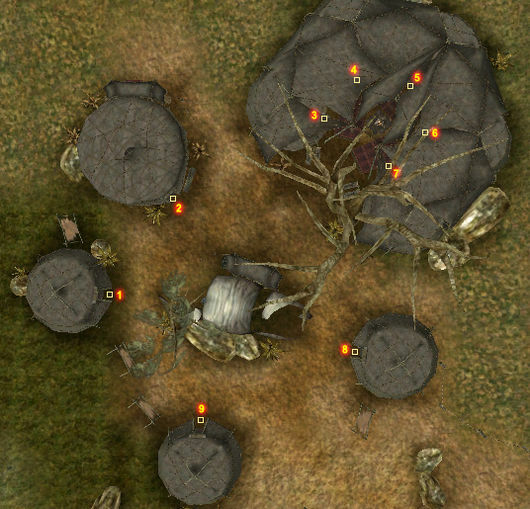 Members of the tribe claim the entire northern section of the Grazelands as their hunting and herding territory. The only services available are the healing services of their healer (Mamaea), of their Wise Woman (Sinnammu Mirpal), who will also create spells for sale, and the tribal trader (Lanabi), though he has generally little goods or gold. Ahemmusa Nerevarine: Travel to the Ahemmusa camp in order for them to recognize you as the Nerevarine. Meeting with a Wise Woman: Arrange a meeting with Skink-in-Tree's-Shade and an Ashlander Wise Woman. Dreams of a White Guar: Help Urshamusa Rapli find the white guar she has been dreaming about. Ahemmusa Camp is also present in The Elder Scrolls Online, but in a completely different location during that time period. They are evidently a nomadic tribe. This page was last modified on 16 November 2018, at 06:30.